We have marked a distinct and dynamic position in the market by providing a quality assured array of Optical Bench. Simple form : one meter long with six sliders having two lens holders, one wite gauge screen, one ground glass screen, one pin on stand & one candle holder. Made of entirely fine wood polished superior quality. One meter long, double steel rod accurately graduated, other details are same as single rod optical bench. Since the year 1990, Photonix Scientific Corporation has been one of the most prominent Laboratory Optical Bench Manufacturers and Suppliers. Some major factors contributing towards Optical Bench are beam, object, source, lens, mirror and aperture. A Compact Optical Bench also functions on the same principle, more or less. Wooden top, four aluminum metal base sliders with index marks enables readings on scale. Sliders fitted with brass N.P. Pipes for holding accessories. One slider with transverse slow motion arrangement. With 2 Universal lens holders and 2 optical pins. 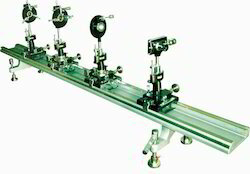 Optical Bench is readily used in school & colleges for performing optics experiment. Available in three different materials: Iron, Brass & wooden. 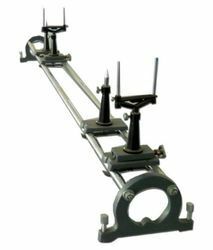 Provided with uprights, rod stand & optical pins as a complete accessories.